%VIRTUAL-SkimlinksPromo%The Royal Mint has issued a collectable £20 coin to mark 100 years since the outbreak of the First World War. 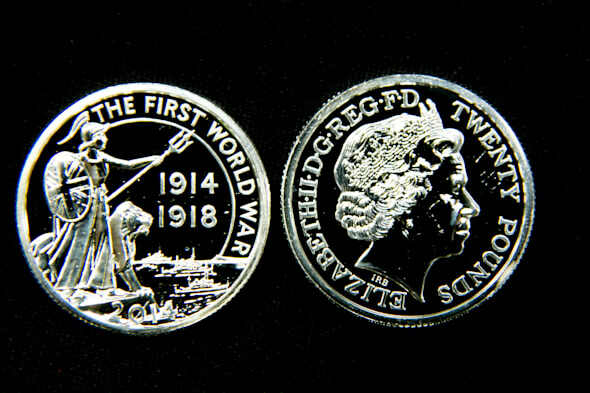 It's only the second £20 coin ever to be minted and forms part of a major series of commemorative coins that will chart the emotive Great War journey, from outbreak to armistice, over the next five years. The reverse features the national symbol of Britannia designed by sculptor John Bergdahl. It shows her watching over the first ships transporting soldiers to France on the eve of war. The obverse carries the current portrait of Her Majesty the Queen, designed by Ian Rank-Broadley. The £20 coin has been cast in fine silver and struck to Brilliant Uncirculated standard. A limited issue of 250,000 coins have been produced and can be purchased from the Royal Mint's website for its face value of £20.